A very Happy New Year to all the wonderful readers of The Silver Voice from Ireland Blog. I would like to take this opportunity to thank each and every one who has visited my blog during 2013. Athbhliain faoi Mhaise daoibh to léir! May 2014 be all that you need it to be! 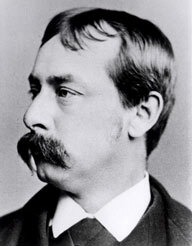 The most reprinted newspaper editorial of all time was published in the The New York Sun in 1897, and was the work of Francis Pharcellus Church. 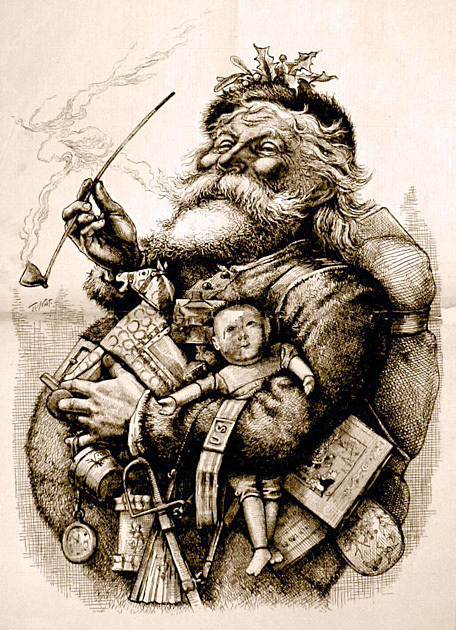 Each Christmas I seek out this editorial to read, for it is a reminder of the true spirit of Christmas to all of us former children who no longer write letters to Santa. Which one of us will ever forget the magic of waking to find that Santa had called while we slept, and left unimaginable treasures by our beds,or under the tree, or in the living room? – Perhaps a train set, perhaps a spinning top, perhaps a doll or a book or an orange or a meccano set.Today as my sister and I talked about this we remembered that Santa left one toy and a book or jigsaw for the 6 of us – things that stood out were : a big humming spinning top, a black push along dog on 4 wheels, a three-note melodeon, my brother’s train set, a doll that cried, a big doll whose arms and legs were joined up by elastic, a jigsaw, a red tin pedal operated car and a big red three-wheeled tricycle. As we grow older the magic disappears, but it is good to remind ourselves that it is still there in the form of joy and romance and kindness and friendship, not to mention in the faces of enthralled and delighted children at Christmastime. 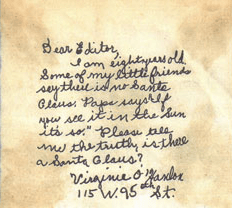 So here it is once again – the story of 8-year-old Virginia O’Hanlon, who wrote to the New York Sun newspaper in September 1897, to ask Does Santa Exist? Virginia’s family read this newspaper and set great store by it as an authority on many things. The reply to her letter has stood the test of time. The editorial was something of a sensation and the New York Sun reprinted it every year for over 50 years until the newspaper closed down in 1949. In Ireland, as well as in many other countries across the world children will write letters to their cultural Santa as they have done for decades and they will continue to do for generations to come and he will continue to make glad the heart not only the heart of childhood, but the hearts of children of all ages. Merry Christmas! Christmas! A perfect celebration for those of us in the northern hemisphere, living in the dark days of winter, with long nights and short days, cool and often freezing weather. Some of us resist the tinsel and glitter and hype for as long as we can, but in the last weeks before the big day we too must succumb to the inevitability of it. Last minute cards, last minute Christmas trees, house decorations and gift purchases all add to the excitement! In December 2012 I made this post about Christmas in our home which I am reposting here as it epitomizes all that is Christmas, past and present. I hope you enjoy it! Similar preparation of fruit took place some weeks later when the Christmas puddings were made. A stale loaf was laboriously made into breadcrumbs. A bottle of stout was added to the mixture which made mixing easier for smaller people and we all ‘had a go’. The well-stirred mixture was placed on double layers of large squares of cotton – old sheets made excellent pudding cloths- the corners were gathered up and tied securely for boiling, resulting in a beautiful round pudding! Christmas was forgotten about then until about a week before whenthe Yule Log was baked as were my mother’s speciality – ‘Snowballs’. These were rounded balls of cake mixture, baked, then covered in jam and rolled in shredded coconut – they always looked wonderfully tempting! The two rich fruit cakes were iced (two cakes as my younger brother had a birthday on Christmas Day and he was the only member of the family to have a birthday cake) and decorated. Then there was the marzipan to make – we smaller ones could not help with this as it was a very stiff mixture of ground almonds and sugars, but it looked lovely when done! About three days before Christmas we had the Royal Icing that was spread all over the marzipan-ed cakes and we enjoyed placing lovely little silver balls and little snowmen and tiny Christmas trees into the icing. The Birthday cake usually had less seasonal characters stuck into the royal icing, but always had NOEL piped o the surface, for that is my brother’s name . This post was inspired by Pauleen at Family History Across the Seaswho in her blog invited her readers to join in with the Christmas Geneameme. It sent me off delving into my family traditions and I am delighted to have had the chance to record a typical Christmas for my family. Comments Off on There’s something about Christmas..